This weekend I managed to grab another day to myself and spent the time in the garden again. Last week I put together a pallet garden, but I can’t lift that into place until next weekend so I had to find something to do so I wouldn’t give in and move it. 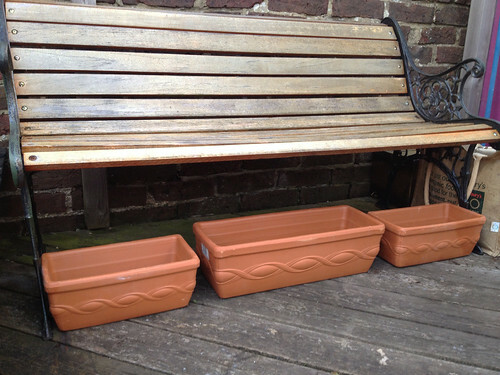 I still had a lot of bedding plants left over and had stuffed some of them into various containers (saucepans, a pair of stillettoes, an old boot and some cracks between the wall and an old railway sleeper). 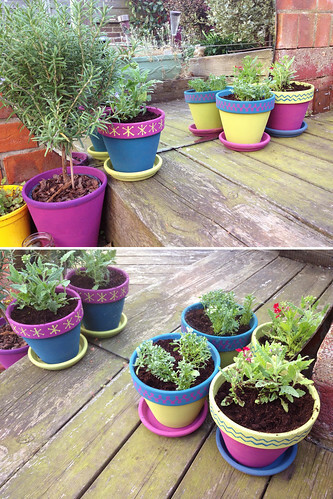 I popped out for some cheap terracotta pots and planters and dug out all my bargain tester pots (none more than 50p or left over from when we started decorating the house). Cheap and cheerful. 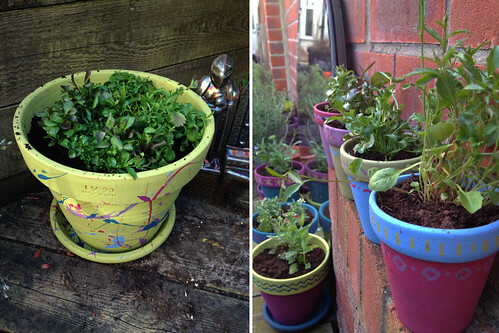 I tend to avoid primary colours for the pots but that still gives me plenty of scope. 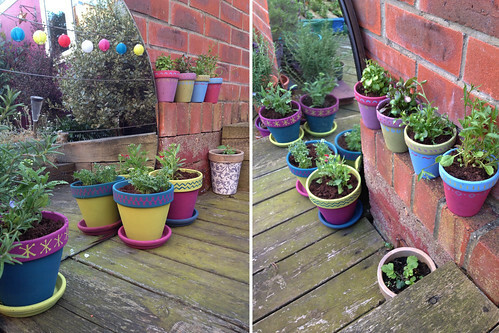 The original plan was simply to paint everything, as I had done with several larger pots last summer. But once I got going, I first decided to make the wider rims a different colour, and then it seemed natural to add some simple decorations. 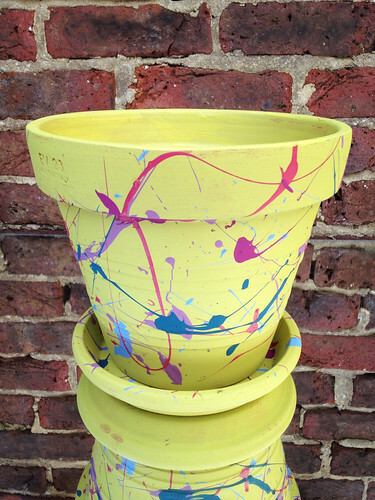 I painted the largest pot green and splashed each of the other colours onto it for a random look. 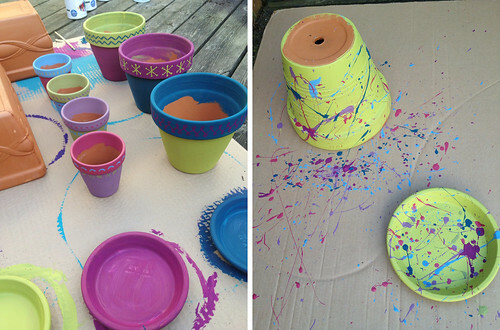 The small pots used up some slightly muted paints which were almost empty. It doesn’t take much paint for each pot so I had plenty to splash on the green pot afterwards (and still have some over). Simple decorations were painted on quickly and randomly. No point worrying about being perfect when they’ll be partly hidden behind foliage soon. 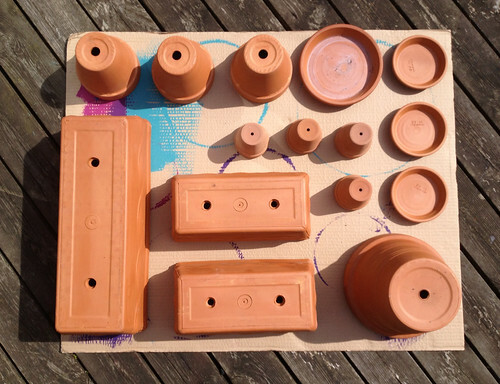 The larger pots were done in stronger colours – but you can see that the general range of colours is similar. Just go with whatever you like or whatever you’ve got. If you use more than three colours, suddenly everything ‘goes’. Slightly more complex designs but again you can see that I’ve done them quickly – they still look effective so don’t worry about whether you think you’re ‘arty’ or not. 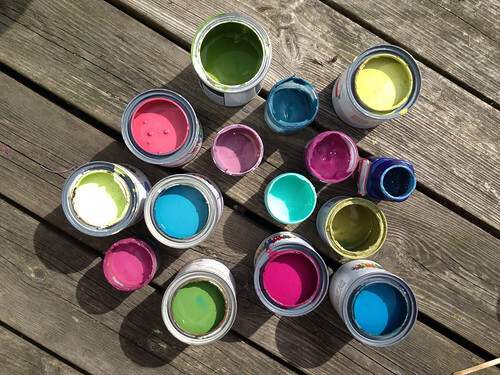 Or why not get the kids to paint some? 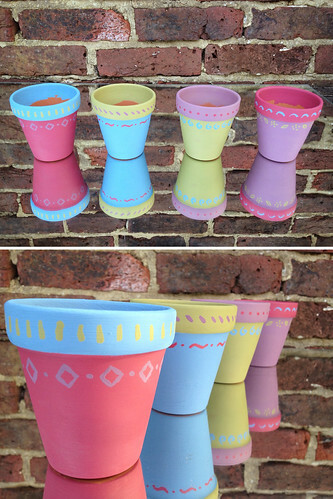 As the terracotta pots are so porous, the water-based paint dries really quickly. Most tester pots are matt, but even some satin finish paints behave the same way so you can get all the painting done on one sesssion. This also means that the pot can still ‘breathe’. Then it was time to plant them up. I had a few alyssum, some mixed verbena (some of which had started to flower) and still lots of lobelia of different types (upright and trailing) and different colours. The lobelia I planted last year flowered profusely and continued right through the summer until October so they were a natural choice. 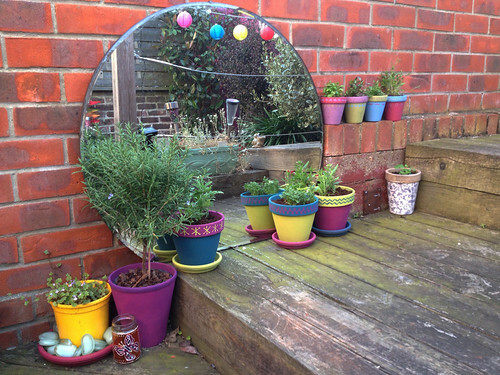 The pots were put in place alongside my most recent £5 charity shop mirror (you can see my other garden mirrors in one of my garden project posts from last spring). They’re going to look great when they start to flower and settle in. 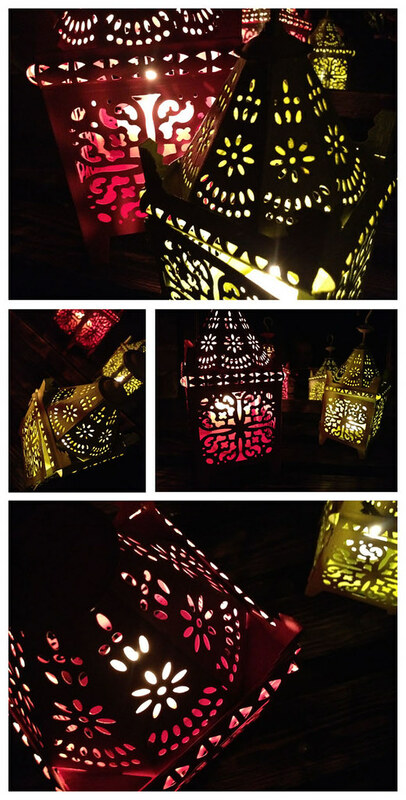 For colour in the evening I have a lot of pretty solar lights and some painted lanterns (which I did last spring, also using tester pots and leftover paint). 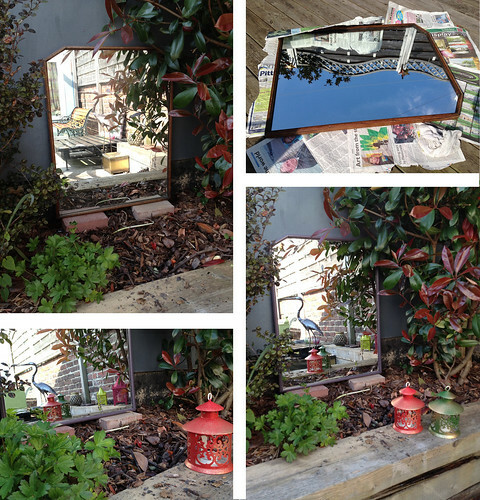 Double the colour (and flowers) with a few well placed mirrors around the garden. Because of the decorations, I didn’t get to paint the three planters so that’s another job for a sunny evening after work this week, or maybe next weekend. 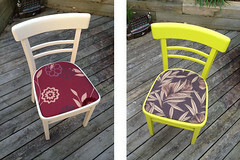 I also need to treat and paint the bench and get my tomatoes off the kitchen windowsill and into the garden. I’ll show you how I get on next weekend when I’ll also be raising the pallet garden to its vertical position. Why not sign up to hear about updates as soon as they’re posted. Still plenty to do this week. You don’t need a big garden, just a few ideas.